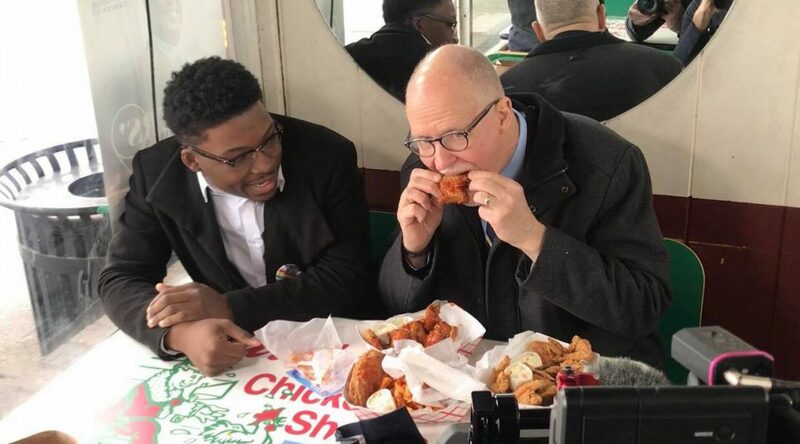 His father was a past owner of a Kentucky Fried Chicken store in the city, but that didn’t stop Chicago Mayoral Candidate Paul Vallas from meeting up with former Chicago mayoral candidate – and newly-minted political moderator – Ja’Mal Green at Harold’s Chicken for a cultural encounter. Green couldn’t believe the candidate hadn’t been to Harold’s. Vallas took the challenge to eat there after a candidate forum hosted by Green and NBC Chicago Reporter Mary Ann Ahern exposed his lack of culture. Vallas was ultimately coerced into putting his money – or Harold’s – where his mouth was.